A large city located in the Sonoran desert of Southern Arizona, very close to the U.S.-Mexico border. The area on which the city is now built has been populated for many centuries by indigenous peoples, namely the Tohono O’odham and the Pima. With the arrival of the Spanish conquistadores in the late 1600s, a mission was built near the Santa Cruz River, and a settlement developed around it. The town grew as a center for commerce, and later on, in the late 1700s, as a strategic military fort in the battles between Spain and Mexico. With the American purchase of the Arizona territory in 1854, Tucson saw a significant growth, especially after the arrival of the railroad in 1880. The state of Arizona, however, was not officially annexed until 1912, and by then the city was well-established as a bilingual (Spanish and English), multicultural hub, serving its vast surrounding areas of small, rural communities. Tucson is home to a few general and specialized hospitals, a large airforce base, and the University of Arizona, which was founded in 1885 and remains a major center of cultural development and economic growth. 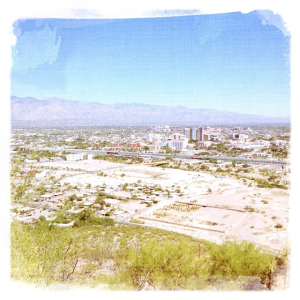 "Tucson, Arizona, October 13, 2013" by Kevin Dooley is licensed under CC BY. N.d. Tucson. http://www.britannica.com/place/Tucson, accessed April 4, 2016. N.d. About Tucson. https://www.tucsonaz.gov/info/about-tucson, accessed April 4, 2016.